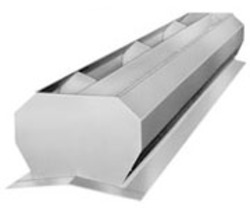 We specialize in the manufacturing and supplying of an extensive range of Ridge Ventilators. The range of ventilators offered by us is widely regarded for its easy installation. Known for their fine finish, these are highly demanded in the market. Manufactured using advanced technologies, these are widely praised by the customers we have. Sri Balaji Enterprises is recognized as one of the most specialized manufacturers and designers of roof ridge ventilators, which are widely used in construction sector. These continuous ridge ventilators are designed by skilled professionals keeping in mind the different building and structure styles. The Roofvent Ventridge should be mounted on the ridge of a stopping structure or above areas of concentrated heat on flat roofed buildings. The hot air is then replaced by cooler air which must be allowed to enter the building through openings at its base. The Roofvent Ventridge provides continuous natural ventilation with effective weather protection, under normal weather conditions. Our skilled designers have designed these commercial ridge ventilators to effectively remove heat, smoke and fumes on an ongoing basis from factories and industrial buildings. Customers prefer Roofvent Ridge Ventilation System for being best in performance and economically priced. Looking for Ridge Ventilators ?